The past two years have seen an enormous issuance of new government liabilities. During the two years ended September 30, 2009, the amount of U.S Treasury debt held by the public (outside of agencies such as the Social Security Administration and the Federal Reserve) surged by more than 50%, from $5.05 trillion to $7.55 trillion. During that time, the Fed's holdings of U.S. Treasuries actually shrank by about $10 billion, yet the Fed has explosively increased U.S. monetary base from $850 billion to $2.02 trillion, fueled by massive purchases of Fannie Mae and Freddie Mac's mortgage-backed securities. On Christmas eve, the Treasury quietly announced that it would be providing unlimited bailout funding for Fannie and Freddie over the next three years, since the underlying cash flows received by Fannie and Freddie on these mortgages are not sufficient to keep the agencies solvent. In total, the quantity of U.S. government liabilities forced into the hands of the public has soared by $3.62 trillion - an increase of 61% since the third quarter of 2007. Keep this figure in mind as various pittances are reported to be returned from TARP funds provided to various financial institutions. Likewise, remember that any interest "earned" by the Federal Reserve on the assets it holds is interest that is either implicitly or explicitly paid by the Treasury, and is returned thereto. Of course, this figure will get progressively larger as government revenues fall substantially short of outlays, and can be expected to do so for years to come. It is in this context that we should consider inflation risks over the coming decade. At present, inflation risks are hardly considered to be problematic by Wall Street. From the standpoint of the next few years, my impression is that this complacency is probably well-founded, but only because we are likely to observe a second wave of credit losses that will create fresh "safe-haven" demand for default-free government liabilities. From a longer-term perspective, however, I believe that inflation will be a major event in the latter part of the coming decade, with the consumer price index roughly doubling over the next ten years. As exchange rates and commodity prices tend to be more forward-looking and less "sticky" than the prices of goods and services, it is likely that these markets will move substantially well before the eventual peak in CPI inflation. I have not always held such concerns about inflation or commodities. A year-and-a-half ago, I argued that strong disinflationary pressures were likely to emerge, and I expressed a great deal of skepticism about the sustainability of the commodities surge, which had pushed the price of oil to $150 a barrel (see July 7, 2008 The Outlook for Inflation and the Likelihood of $60 Oil). At the time, the rush to commodities was not based on general inflation concerns, but instead on the view that demand from China and India would drive prices ever higher. Frankly, I'm still unconvinced that China will be capable of enjoying sustained economic growth without shooting itself in the foot as a result of its wholly undemocratic leadership and weakly-developed banking industry. It is not typical that free enterprise "growth miracles" thrive for long in economies in the constant grip of bureaucrats (witness Japan about 1988, and the awkward end of that growth miracle). So although oil was pushing new highs in mid-2008, I argued that "the problem will emerge a few months from now, as a) economic demand softens further, b) planned production hikes actually emerge, and c) weakening price momentum encourages speculators to close long positions instead of rolling them forward. At that point, I expect that net speculative positions will plunge by 10-15% of open interest and we'll see a sudden glut on the market for spot delivery. It should not be surprising if this speculative unwinding takes the price of crude below $60 a barrel by early next year." What is different now is that, over time, the massive expansion of government liabilities can ultimately do nothing but undermine the value of the U.S. dollar relative to real goods and services. Whether it undermines the U.S. dollar relative to other currencies depends on the relative propensity for other countries to go on a similar binge of fiscal recklessness. As John Mauldin says, "the dollar may be the worst currency in the world, except for all the others." Indeed, over the near term, credit concerns would likely have the effect of buoying the dollar and pressuring the dollar price of commodities thanks to a safe-haven rush for dollars. While oil has rebounded strongly from the mid-$30's, which it hit earlier this year, my impression is that a second wave of credit losses is likely to take a good deal of the recent progress back before we observe much more sustained gains several years out. Nevertheless, longer term, the relative supply of U.S. government liabilities will become an overriding factor. To say that the value of the dollar is likely to decline relative to other goods and services is another way of saying that the dollar price of goods and services is likely to increase. Ultimately, crude oil above $200 and gold prices above $2000 will likely owe themselves far less to robust demand in China and elsewhere than to sheer deterioration in the purchasing power of the U.S. dollar a decade from now. Will Rogers once said "It ain't what people don't know that hurts them. It's what they do know that ain't true." That observation certainly applies to the myths and realities about inflation. Mainstream economists and Wall Street analysts hold two very specific views about inflation almost without exception. The first is that inflation is caused by monetary policy, and specifically by excessive money creation. That view is often accompanied by a slight modification that inflation can also be caused by excessive economic growth. 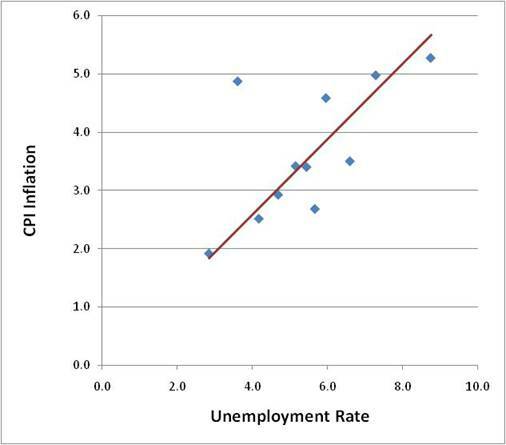 The second view is that there is a predictable relationship between inflation and unemployment, known as the Phillips Curve, such that high unemployment is associated with low inflation, and low unemployment is associated with high inflation. These views are either incomplete or inconsistent with actual economic data. But what's more interesting is that they're actually misinterpretations of economic theory. In order to fully understand this, you have to briefly suspend what you know, and carefully walk through a little bit of economic theory and what it implies about reality. Reality, as it turns out, behaves very much as theory suggests ... and not much as Wall Street believes (a few portions below are reprinted from the July 7, 2008 weekly comment). To understand inflation, it helps to know a little bit about "marginal utility." The typical way I used to teach my economics undergraduates was to get them thinking about ice cream. The first cone might give you a lot of happiness. But if you eat a second cone, you'll get a little less enjoyment. The third cone might be just slightly enjoyable. You might be indifferent toward the fourth, and are likely to be averse (negative marginal utility) to eating a fifth. So as you increase the availability of a good, the "marginal utility" - the value you place on an additional unit - declines. The same basic principle holds for the economy as a whole. Suppose that given the economy-wide supply of ice cream, the marginal utility of ice cream is six smiley faces, and the marginal utility of a pencil is two smiley faces. Given that, the price of an ice cream cone, in terms of pencils, will be just the ratio of the marginal utilities, so an ice cream cone will cost you 3 pencils. Exactly the same holds true for money itself. If you hold a dollar in your wallet, you might be giving up some potential interest earnings, but you're willing to hold it anyway because that dollar of currency provides certain usefulness in terms of making day-to-day transactions and so forth. If that dollar is held as reserves against checking accounts at a bank, that dollar is implicitly providing a certain amount of banking services. So a dollar bill has a certain amount of marginal utility, by virtue of legal factors like reserve requirements on checking accounts, and convenience factors like the ability to buy a nutty sundae with cash at the ice cream truck. As a result, the prices of various goods and services in the economy, in terms of dollars, will reflect the ratios of marginal utilities between "stuff" and money. The dollar price of good X is just the marginal utility of X divided by the marginal utility of a dollar. So how do you get inflation? Simple. 2) Reduce the marginal utility of dollars: This happens either if the supply of dollars becomes more abundant, or if the demand to hold dollars becomes weaker. Consider how this worked during the Great Depression. Output declined enormously, but the reason was that demand collapsed. The marginal utility of goods and services most likely declined during that period even though production itself was down. At the same time, despite a rapid increase in the monetary base during the Depression, people were frantic to convert their bank deposits into currency, so even the monetary growth that occurred wasn't nearly enough. The frantic demand for currency, resulting from credit fears, translated into a major increase in the marginal utility of money. So what happened to prices during the Great Depression? Think in terms of the marginal utilities: the marginal utility of "stuff" dropped, while the marginal utility of money soared. The result was rapid price deflation. In short, inflation results from an increase in the marginal utility of goods and services, relative to the marginal utility of money. It can reflect supply constraints, unsatisfied demand, excessive growth of government liabilities, or a reduction in the willingness of people to hold those liabilities. This forces us to think twice about the idea that economic growth causes inflation. As it happens, faster economic growth is correlated with lower, not higher inflation. Inflation does tend to become a problem in the later stage of economic booms, but not because the economy is growing too fast. Rather, inflation accelerates because the economy begins to hit capacity constraints and is therefore not able to grow fast enough. The marginal utility of goods rises at the same time that speculation in risky assets encourages people to abandon cash balances, so that the marginal utility of government liabilities declines. The present situation is mixed. Demand has collapsed, so the marginal utility of goods is depressed. At the same time, there is enough residual risk aversion to keep the marginal utility of money elevated. For that reason, inflation has been contained despite a monstrous increase in the quantity of government liabilities. This situation is likely to endure for a while in the likely event that we get further credit difficulties and sustained unemployment. But it will not endure an eventual economic recovery a few years out. At that point, the huge stock of government liabilities will weigh on the marginal utility of money, while recovering demand presses upward on the marginal utility of goods and services. The result will be a very large and probably sustained inflation in the U.S. in the second half of the coming decade. The importance of fiscal policy in determining inflation is immediately apparent if we think in terms of the full or "general" equilibrium imposed by a government budget constraint. See, if you're a banana republic and want to run a huge government spending program, you're not likely to go through the etiquette of issuing government bonds or setting a proper marginal tax policy. You'll just print up pieces of paper. Friedman's first dictum that "inflation is always an everywhere a monetary phenomenon" is largely a reflection of a long history across many countries that heavy government spending financed by printing money predictably leads to inflation. In particularly unproductive economies, it leads to hyperinflation. But what if the government spending is financed by issuing bonds? It's tempting to think that somehow printing money means an increase in spending power, while issuing bonds means that the government is taking something in return for what it spends, but it's important to focus on the general equilibrium. In both cases, regardless of whether government finances its spending by printing money or issuing bonds, the end result is that the government has appropriated some amount of goods and services, and has issued a piece of paper - a government liability - in return, which has to be held by somebody. Moreover, both of those pieces of paper - currency and Treasury securities - compete in the portfolios of individuals as stores of value and means of payment. The values of currency and government securities are not set independently of each other, but in tight competition. That is particularly true today, when bank balances are regularly swept into interest earning vehicles as often as every night. To the extent that real goods and services are being appropriated by government in return for an increasing supply of paper receipts, whatever the form, aggressive government spending results in a relative scarcity of goods and services outside of government control, and a relative abundance of government liabilities. The marginal utility of goods and services tends to rise, the marginal utility of government liabilities of all types tends to fall, and you get inflation. This is important, because it means that the primary determinant of inflation is not monetary policy but fiscal policy . Contrast the preceding chart with the relationship between CPI inflation and the growth of U.S. government spending. Milton Friedman is widely known for two phrases, one which is half right, and one which is exact. The half-right dictum is that "inflation is always and everywhere a monetary phenomenon." It's half right because a government spending expansion, regardless of the form, will tend to raise the marginal utility of goods and services while lowering the marginal utility of government liabilities. It's very true that the major hyperinflations in history have been triggered by currency expansion, but as long as a government appropriates goods and services to itself in return for pieces of paper that compete as stores of value and means of exchange in the portfolios of investors, you'll get inflation. The completely correct dictum from Milton Friedman is this: "the burden of government is not measured by how much it taxes, but by how much it spends." Two weeks ago (Timothy Geithner Meets Vladimir Lenin), I made some remarks about the Phillips Curve that are far enough outside the mainstream that they deserve some evidence. I noted "It is commonly argued that we cannot observe inflation with unemployment so high. In my view, this is a misinterpretation of A.W. Phillips (1958) analysis. While the famed "Phillips Curve" was described as a relationship between (nominal) "money" wages and unemployment, the British data Phillips used was from a period when Britain was on the gold standard, and the general price level was extremely stable. Thus, any wage inflation observed by Phillips was actually real wage inflation. "The Phillips Curve is simply a standard economic argument about relative scarcity. It says that when the labor markets are tight, nominal wages rise faster than the rate of general inflation (i.e. real wages rise), and when unemployment is high, nominal wages rise slower than the rate of general inflation (i.e. real wages fall). As we observed in the 1970's, high unemployment can exist in concert with high rates of inflation. All that happens, in that case, is that wages tend to rise slower than prices. Assuming labor productivity is growing as well, real wages don't keep pace with productivity growth. In any event, unemployment emphatically does not prevent the inflationary consequences of reckless creation of government liabilities." Quite simply, the view of the Phillips Curve as a relationship between unemployment and general price inflation wasn't even part of Phillips work, nor is it consistent with the data. This is almost frightening, because we continue to send bright-eyed undergraduate economics students out into the world believing something about Phillips' work that, as Adam Smith might say, "was no part of his intention." The charts below are based on data since 1947. Monthly unemployment rates were sorted from highest to lowest, divided into equal groups, and the average unemployment rate and year-over-year CPI inflation rate were plotted for each group. 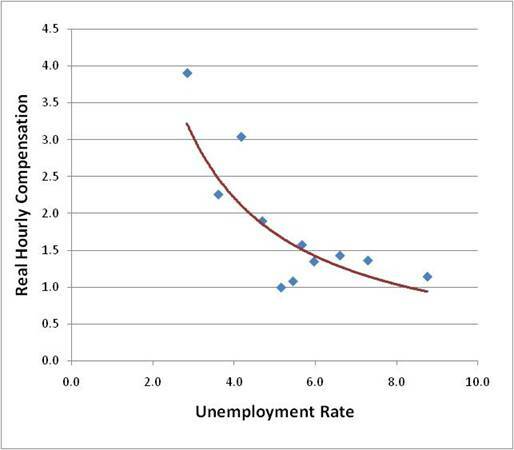 What we observe in the data is strikingly opposite to the standard (mis)interpretation of the Phillips Curve. Indeed, higher unemployment is generally associated with higher, not lower general price inflation. Contrast this with what I would assert is the real Phillips curve, which is simply a statement about labor scarcity. It says, in a very unadorned way, that when labor is scarce (low unemployment), the price of labor tends to rise relative to the price of other things (thus we observe real wage inflation). In contrast, when labor is plentiful (high unemployment), the price of labor tends to stagnate relative to the price of other things (real wages stagnate). Since productivity growth tends to be positive over time, it turns out that real wages actually fall on a productivity-adjusted basis when unemployment is high. From this perspective, it is no surprise that real wages fell by 1.6% in 2009, even as reported productivity grew. As of last week, the Market Climate for stocks remained characterized by overvaluation, overbought conditions, overbullish sentiment, and upward pressures on yields - a situation that has historically been associated with a moderate continuation of upward stock market progress and a tendency to make successive but very marginal new highs, typically followed by abrupt and often severe market losses within a time window of about 10-12 weeks. As usual, that's not a forecast - just a regularity. But it's a harsh enough regularity to turn our knuckles white here, given the depressed and complacent level of the CBOE volatility index (VIX) and the little-observed upward pop in credit default spreads last week. The Strategic Growth Fund is fully hedged. In bonds, the Market Climate last week was characterized by relatively neutral yield levels and still moderately negative yield pressures. The widening in credit spreads last week was not large enough to put much downward pressure on Treasury yields, but we did see some retreat on a bit of safe-haven demand. For now, the Strategic Total Return Fund continues to carry an average duration of about 4 years, mostly in TIPS and Treasuries with maturities of less than 10 years. Eventually, I expect that we will carry a significant exposure in TIPS, precious metals and other inflation hedges, along with a greater tendency toward commodity exposure in Strategic Growth, but at present, inflation pressures are likely to remain subdued until we get further through the debt restructuring cycle. The phrase "debt restructuring" didn't get much use during the past year. I suspect that we will hear it with much more frequency in the year ahead. "I want to use as a subject from which to preach this morning a very familiar subject, and it is familiar to you because I have preached from this subject twice before to my knowing in this pulpit. I try to make it a, something of a custom or tradition to preach from this passage of Scripture at least once a year, adding new insights that I develop along the way out of new experiences as I give these messages. Although the content is, the basic content is the same, new insights and new experiences naturally make for new illustrations. "So I want to turn your attention to this subject: "Loving Your Enemies." It's so basic to me because it is a part of my basic philosophical and theological orientation—the whole idea of love, the whole philosophy of love. In the fifth chapter of the gospel as recorded by Saint Matthew, we read these very arresting words flowing from the lips of our Lord and Master: "Ye have heard that it has been said, 'Thou shall love thy neighbor, and hate thine enemy.' But I say unto you, Love your enemies, bless them that curse you, do good to them that hate you, and pray for them that despitefully use you; that ye may be the children of your Father which is in heaven." "Over the centuries, many persons have argued that this is an extremely difficult command. Many would go so far as to say that it just isn't possible to move out into the actual practice of this glorious command. But far from being an impractical idealist, Jesus has become the practical realist. The words of this text glitter in our eyes with a new urgency. Far from being the pious injunction of a utopian dreamer, this command is an absolute necessity for the survival of our civilization. Yes, it is love that will save our world and our civilization, love even for enemies. "Now let me hasten to say that Jesus was very serious when he gave this command; he wasn't playing. He realized that it's hard to love your enemies. He realized that it's difficult to love those persons who seek to defeat you, those persons who say evil things about you. He realized that it was painfully hard, pressingly hard. But he wasn't playing. We have the Christian and moral responsibility to seek to discover the meaning of these words, and to discover how we can live out this command, and why we should live by this command. "Now first let us deal with this question, which is the practical question: How do you go about loving your enemies? I think the first thing is this: In order to love your enemies, you must begin by analyzing self. And I'm sure that seems strange to you, that I start out telling you this morning that you love your enemies by beginning with a look at self. It seems to me that that is the first and foremost way to come to an adequate discovery to the how of this situation. "Now, I'm aware of the fact that some people will not like you, not because of something you have done to them, but they just won't like you. But after looking at these things and admitting these things, we must face the fact that an individual might dislike us because of something that we've done deep down in the past, some personality attribute that we possess, something that we've done deep down in the past and we've forgotten about it; but it was that something that aroused the hate response within the individual. That is why I say, begin with yourself. There might be something within you that arouses the tragic hate response in the other individual. "This is true in our international struggle. Democracy is the greatest form of government to my mind that man has ever conceived, but the weakness is that we have never touched it. We must face the fact that the rhythmic beat of the deep rumblings of discontent from Asia and Africa is at bottom a revolt against the imperialism and colonialism perpetuated by Western civilization all these many years. "And this is what Jesus means when he said: "How is it that you can see the mote in your brother's eye and not see the beam in your own eye?" And this is one of the tragedies of human nature. So we begin to love our enemies and love those persons that hate us whether in collective life or individual life by looking at ourselves. "A second thing that an individual must do in seeking to love his enemy is to discover the element of good in his enemy, and every time you begin to hate that person and think of hating that person, realize that there is some good there and look at those good points which will over-balance the bad points. "Somehow the "isness" of our present nature is out of harmony with the eternal "oughtness" that forever confronts us. And this simply means this: That within the best of us, there is some evil, and within the worst of us, there is some good. When we come to see this, we take a different attitude toward individuals. The person who hates you most has some good in him; even the nation that hates you most has some good in it; even the race that hates you most has some good in it. And when you come to the point that you look in the face of every man and see deep down within him what religion calls "the image of God," you begin to love him in spite of. No matter what he does, you see God's image there. There is an element of goodness that he can never slough off. Discover the element of good in your enemy. And as you seek to hate him, find the center of goodness and place your attention there and you will take a new attitude. "Another way that you love your enemy is this: When the opportunity presents itself for you to defeat your enemy, that is the time which you must not do it. There will come a time, in many instances, when the person who hates you most, the person who has misused you most, the person who has gossiped about you most, the person who has spread false rumors about you most, there will come a time when you will have an opportunity to defeat that person. It might be in terms of a recommendation for a job; it might be in terms of helping that person to make some move in life. That's the time you must do it. That is the meaning of love. In the final analysis, love is not this sentimental something that we talk about. It's not merely an emotional something. Love is creative, understanding goodwill for all men. It is the refusal to defeat any individual. When you rise to the level of love, of its great beauty and power, you seek only to defeat evil systems. Individuals who happen to be caught up in that system, you love, but you seek to defeat the system. "The Greek language, as I've said so often before, is very powerful at this point. It comes to our aid beautifully in giving us the real meaning and depth of the whole philosophy of love. And I think it is quite apropos at this point, for you see the Greek language has three words for love, interestingly enough. It talks about love as eros. That's one word for love. Eros is a sort of, aesthetic love. Plato talks about it a great deal in his dialogues, a sort of yearning of the soul for the realm of the gods. And it's come to us to be a sort of romantic love, though it's a beautiful love. Everybody has experienced eros in all of its beauty when you find some individual that is attractive to you and that you pour out all of your like and your love on that individual. That is eros, you see, and it's a powerful, beautiful love that is given to us through all of the beauty of literature; we read about it. "Then the Greek language talks about philia, and that's another type of love that's also beautiful. It is a sort of intimate affection between personal friends. And this is the type of love that you have for those persons that you're friendly with, your intimate friends, or people that you call on the telephone and you go by to have dinner with, and your roommate in college and that type of thing. It's a sort of reciprocal love. On this level, you like a person because that person likes you. You love on this level, because you are loved. You love on this level, because there's something about the person you love that is likeable to you. This too is a beautiful love. You can communicate with a person; you have certain things in common; you like to do things together. This is philia. "The Greek language comes out with another word for love. It is the word agape. And agape is more than eros; agape is more than philia; agape is something of the understanding, creative, redemptive goodwill for all men. It is a love that seeks nothing in return. It is an overflowing love; it's what theologians would call the love of God working in the lives of men. And when you rise to love on this level, you begin to love men, not because they are likeable, but because God loves them. You look at every man, and you love him because you know God loves him. And he might be the worst person you've ever seen. "And this is what Jesus means, I think, in this very passage when he says, "Love your enemy." And it's significant that he does not say, "Like your enemy." Like is a sentimental something, an affectionate something. There are a lot of people that I find it difficult to like. I don't like what they do to me. I don't like what they say about me and other people. I don't like their attitudes. I don't like some of the things they're doing. I don't like them. But Jesus says love them. And love is greater than like. Love is understanding, redemptive goodwill for all men, so that you love everybody, because God loves them. You refuse to do anything that will defeat an individual, because you have agape in your soul. And here you come to the point that you love the individual who does the evil deed, while hating the deed that the person does. This is what Jesus means when he says, "Love your enemy." This is the way to do it. When the opportunity presents itself when you can defeat your enemy, you must not do it. "Now for the few moments left, let us move from the practical how to the theoretical why. It's not only necessary to know how to go about loving your enemies, but also to go down into the question of why we should love our enemies. I think the first reason that we should love our enemies, and I think this was at the very center of Jesus' thinking, is this: that hate for hate only intensifies the existence of hate and evil in the universe. If I hit you and you hit me and I hit you back and you hit me back and go on, you see, that goes on ad infinitum. It just never ends. Somewhere somebody must have a little sense, and that's the strong person. The strong person is the person who can cut off the chain of hate, the chain of evil. And that is the tragedy of hate - that it doesn't cut it off. It only intensifies the existence of hate and evil in the universe. Somebody must have religion enough and morality enough to cut it off and inject within the very structure of the universe that strong and powerful element of love. "I think I mentioned before that sometime ago my brother and I were driving one evening to Chattanooga, Tennessee, from Atlanta. He was driving the car. And for some reason the drivers were very discourteous that night. They didn't dim their lights; hardly any driver that passed by dimmed his lights. And I remember very vividly, my brother A. D. looked over and in a tone of anger said: "I know what I'm going to do. The next car that comes along here and refuses to dim the lights, I'm going to fail to dim mine and pour them on in all of their power." And I looked at him right quick and said: "Oh no, don't do that. There'd be too much light on this highway, and it will end up in mutual destruction for all. Somebody got to have some sense on this highway." "Somebody must have sense enough to dim the lights, and that is the trouble, isn't it? That as all of the civilizations of the world move up the highway of history, so many civilizations, having looked at other civilizations that refused to dim the lights, and they decided to refuse to dim theirs. And Toynbee tells that out of the twenty-two civilizations that have risen up, all but about seven have found themselves in the junk heap of destruction. It is because civilizations fail to have sense enough to dim the lights. And if somebody doesn't have sense enough to turn on the dim and beautiful and powerful lights of love in this world, the whole of our civilization will be plunged into the abyss of destruction. And we will all end up destroyed because nobody had any sense on the highway of history. "Somewhere somebody must have some sense. Men must see that force begets force, hate begets hate, toughness begets toughness. And it is all a descending spiral, ultimately ending in destruction for all and everybody. Somebody must have sense enough and morality enough to cut off the chain of hate and the chain of evil in the universe. And you do that by love. "There's another reason why you should love your enemies, and that is because hate distorts the personality of the hater. We usually think of what hate does for the individual hated or the individuals hated or the groups hated. But it is even more tragic, it is even more ruinous and injurious to the individual who hates. You just begin hating somebody, and you will begin to do irrational things. You can't see straight when you hate. You can't walk straight when you hate. You can't stand upright. Your vision is distorted. There is nothing more tragic than to see an individual whose heart is filled with hate. He comes to the point that he becomes a pathological case. For the person who hates, you can stand up and see a person and that person can be beautiful, and you will call them ugly. For the person who hates, the beautiful becomes ugly and the ugly becomes beautiful. For the person who hates, the good becomes bad and the bad becomes good. For the person who hates, the true becomes false and the false becomes true. That's what hate does. You can't see right. The symbol of objectivity is lost. Hate destroys the very structure of the personality of the hater. "The way to be integrated with yourself is be sure that you meet every situation of life with an abounding love. Never hate, because it ends up in tragic, neurotic responses. Psychologists and psychiatrists are telling us today that the more we hate, the more we develop guilt feelings and we begin to subconsciously repress or consciously suppress certain emotions, and they all stack up in our subconscious selves and make for tragic, neurotic responses. And may this not be the neuroses of many individuals as they confront life that that is an element of hate there. And modern psychology is calling on us now to love. But long before modern psychology came into being, the world's greatest psychologist who walked around the hills of Galilee told us to love. He looked at men and said: "Love your enemies; don't hate anybody." It's not enough for us to hate your friends because—to to love your friends—because when you start hating anybody, it destroys the very center of your creative response to life and the universe; so love everybody. Hate at any point is a cancer that gnaws away at the very vital center of your life and your existence. It is like eroding acid that eats away the best and the objective center of your life. So Jesus says love, because hate destroys the hater as well as the hated. "Now there is a final reason I think that Jesus says, "Love your enemies." It is this: that love has within it a redemptive power. And there is a power there that eventually transforms individuals. That's why Jesus says, "Love your enemies." Because if you hate your enemies, you have no way to redeem and to transform your enemies. But if you love your enemies, you will discover that at the very root of love is the power of redemption. You just keep loving people and keep loving them, even though they're mistreating you. Here's the person who is a neighbor, and this person is doing something wrong to you and all of that. Just keep being friendly to that person. Keep loving them. Don't do anything to embarrass them. Just keep loving them, and they can't stand it too long. Oh, they react in many ways in the beginning. They react with bitterness because they're mad because you love them like that. They react with guilt feelings, and sometimes they'll hate you a little more at that transition period, but just keep loving them. And by the power of your love they will break down under the load. That's love, you see. It is redemptive, and this is why Jesus says love. There's something about love that builds up and is creative. There is something about hate that tears down and is destructive. So love your enemies. "There is a power in love that our world has not discovered yet. Jesus discovered it centuries ago. Mahatma Gandhi of India discovered it a few years ago, but most men and most women never discover it. For they believe in hitting for hitting; they believe in an eye for an eye and a tooth for a tooth; they believe in hating for hating; but Jesus comes to us and says, "This isn't the way." "As we look out across the years and across the generations, let us develop and move right here. We must discover the power of love, the power, the redemptive power of love. And when we discover that we will be able to make of this old world a new world. We will be able to make men better. Love is the only way. Jesus discovered that. "And our civilization must discover that. Individuals must discover that as they deal with other individuals. There is a little tree planted on a little hill and on that tree hangs the most influential character that ever came in this world. But never feel that that tree is a meaningless drama that took place on the stages of history. Oh no, it is a telescope through which we look out into the long vista of eternity, and see the love of God breaking forth into time. It is an eternal reminder to a power-drunk generation that love is the only way. It is an eternal reminder to a generation depending on nuclear and atomic energy, a generation depending on physical violence, that love is the only creative, redemptive, transforming power in the universe. "So this morning, as I look into your eyes, and into the eyes of all of my brothers in Alabama and all over America and over the world, I say to you, "I love you. I would rather die than hate you." And I'm foolish enough to believe that through the power of this love somewhere, men of the most recalcitrant bent will be transformed. And then we will be in God's kingdom."